"Daemon might very well be the most unconventional demon hell has ever known. " Our story begins as Morgan DuPere' is possessed by Daemon... Daemon the Demon, during one of his many magical experimentation's. As this is only Daemon's second time possessing someone, he hasn't quite gotten a feel for how to go about it. He is soon visited by Hades, his immediate supervisor, and given a book: "Practical Possession - A Beginners Guide to Becoming Someones' Inner Demon." Now armed with proper instructions and an encouraging pat on the back from the CEO of hell himself, Daemon sets off to commit some of the darkest acts he can possibly fathom. Littering. Tax Evasion. Purchasing that little USB stick that lets you watch free movies! WHEN WILL HIS REIGN OF TERROR END??!! Exorcists, Fallen Angles, and even God himself are ensnared in this unlikely villains tale. 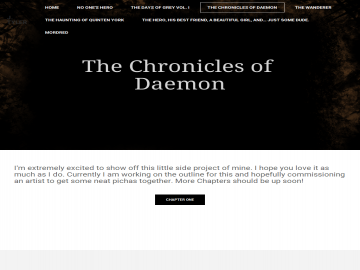 The Chronicles of Daemon has not been reviewed yet. The Chronicles of Daemon has not been recommended yet.